AeroFarms was featured in a Columbia Business School Ideas & Insights article about the many alumni working to feed the 9 billion people expected to inhabit the earth by 2050. The AeroFarms section is below. Read the entire article at www.gsb.columbia.edu. When we think of agriculture, we naturally think of land. But in many places, intensive agriculture has so severely depleted soil and other resources that land can no longer be cultivated; in others, drought has ravaged fertile farmland. And as the global population grows increasingly urban, there’s a need to find more efficient ways to grow food close to those population centers. Building up — the way we build high-rise apartment and office buildings — is a solution that’s gaining attention. New Jersey–based AeroFarms, co-founded by Marc Oshima ’97 and David Rosenberg ’02, is a pioneer in so-called vertical farming. The company produces leafy greens that thrive in a high-tech production method that doesn’t require sunlight, soil, or pesticides. Instead, the company mists water and nutrients onto the plants, which grow atop reusable cloths under LED lights in spacious warehouse-style buildings. Oshima says the company’s proprietary process uses 95 percent less water and produces yields 130 times that of conventional farming, since they can grow and harvest all year in the climate-controlled environment. 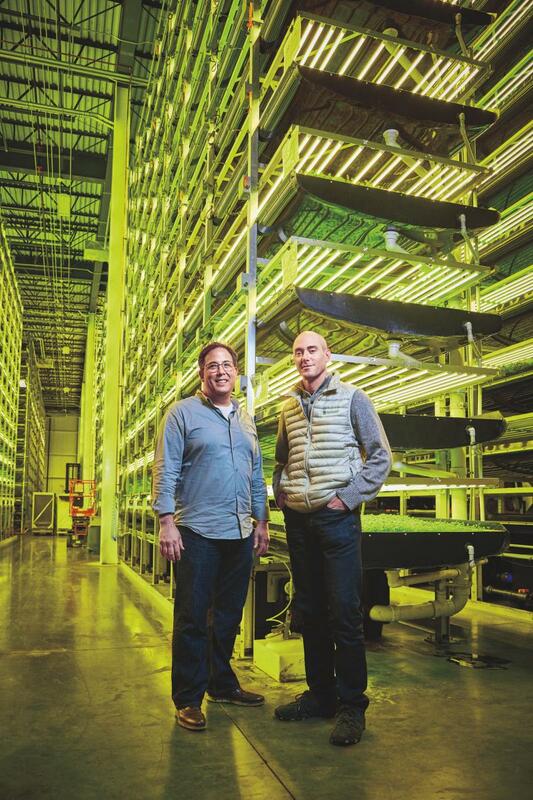 Marc Oshima ’97 (left) and David Rosenberg ’02 in their 30,000-square-foot growing space. I the growing trays, which are 36 feet high, they cultivate arugula, baby kale, and watercress. The greens are sold in a few supermarkets in and around Newark, New Jersey, and are served in the dining rooms of several companies, including the New York Times and Goldman Sachs. AeroFarms also situates production in urban areas near major distribution routes. Its headquarters in Newark is the largest indoor vertical farm in the world, housed in a former steel mill that includes labs for developing new crops. It brings fresh produce to local urban food deserts and provides year-round local employment.